Indian Flag Nail Art Tutorial! You may know that I've been living in India for the past 9 months, and today is India's Independence Day! I could hardly do this Flags of the World tour and not include my current home, right? I figured that today of all days would be the perfect day to post it, too. There's more to India than curry, saris, and Hinduism. I'll be the first to admit that this country is sometimes maddening, but to balance out the madness are some of the most kind, generous, and generally selfless people I've ever met. 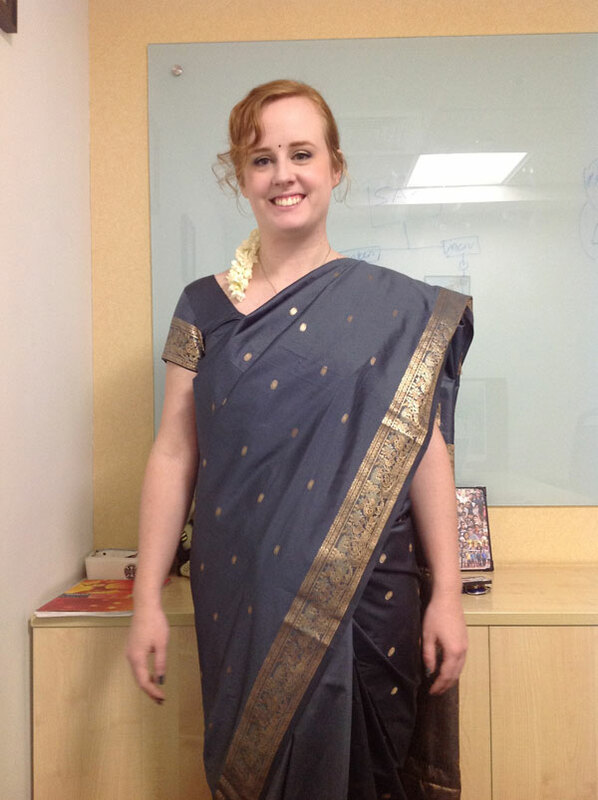 In addition to my Indian flag, nail art tutorial, I wore a saree/sari to work yesterday! (We didn't have work today) I felt awkward and exposed all day, and have a whole new respect for the Indian women that choose to wear saris on a regular basis. I rewarded myself with wearing jeans today. :D My friend Sheba was an absolute godsend, since there was no way I could wrap this thing alone- every time I tried, it looked like a giant slate blue diaper. My friend Sheba fussing over my pleats at the end of the day before having pic taken again. Stupid things kept coming untucked. The back view. I love the pallu (the hanging piece) of this sari- all gold and copper metallic threads. so pretty! Ohh! U look sooo preettyyy in d sari!! I love your blog and the information you put about your life. :) You seem like such a fun and genuine person. I nominated you for a blogger award on my blog. BTW - Thanks for all the awesome nail art! Gorgeous!! What an awesome way to learn about another country's culture. I can't believe you've been there 9 months! But makes sense because I'm pushing my way to being back in the US for 1 year and Chicago for a year. Time sure does fly. Hope you are enjoying yourself there. I love India.. that's so amazing country with so amazing culture and people.. just love it..
Jamaican Flag Nail Art Tutorial, mon. Pirate Flag Nail Art Tutorial! YARRRR! Mexican Flag Nail Art Tutorial! Curiosity Didn't Kill This Cat! Finnish Flag Nail Art Tutorial! German Flag Nail Art Tutorial! Australian Flag Nail Art Tutorial! Canadian Flag Nail Art Tutorial...eh? !